The flammable rating of the material. Example of the rating is 94-VO rating. What is a Schematic Diagram? A drawing that shows, by means of graphic symbols, the electrical connections, components, and functions of an electronic circuit. What is the difference between Gerber Data and Extended Gerber? Extended Gerber the aperture lists is already embedded in the file. What is an aperture file? This information contains size and shape of pads and circuits is defined using D-codes. Hole filling is applied when plated through requires hole fill. After hole fill it goes electroless copper and panel plated. (HASL) a method of coating exposed copper with solder by inserting a panel into a bath of molten solder then passing the panel rapidly past a series of hot air jets. Consists of electroless nickel plating covered with thin layer of immersion gold. The netlist is compiled from the Gerber Data. These connections will be electrically tested for open and shorts. Inner layers which do not connect to the outer layers of the board. Outer layer connection is beginning with one outer layer and not connecting to the other outer layer. What is a Flex circuits? Flex circuits definitions is a printed circuit board that can flex. What is a Rigid flex? Combination of flexible circuits and rigid circuits. What is a Sculpture Flex circuits? Sculptured flex creates exposed conductors beyond the edge of the flex circuits. Bill of Materials a list of components of the assembly such as a printed circuit board. For a PCB the BOM must include reference designators for the components used and descriptions which uniquely identify each component. A BOM is used for ordering parts and, along with an assembly drawing. Fab is used to aid the construction of a printed board. It shows all the locations of the holes to be drilled, their sizes and tolerances, dimensions of the board edges, and notes on the materials and proceeds to be used in manufacturing. A drawing showing the locations of components, with their reference designators, on a printed circuit. Also called component locator drawing. A grade of Flame-Retardant laminate having a substrate of woven-glass fabric and resin epoxy. 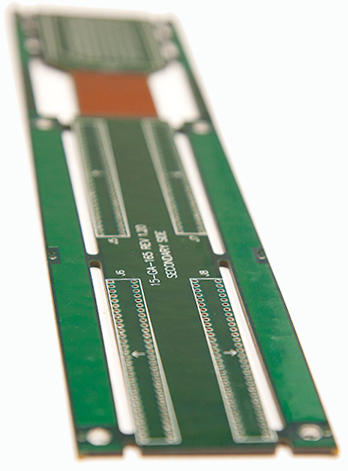 FR-4 is the most common dielectric material used in the construction of PCBs. Dielectric constant is from 4.4 to 5.2 at below-microwave frequencies. As frequency climbs over 1 GHz, the dielectric constant of FR-4 gradually drops. TG 130 to 175. Glass Transition Temperature commonly called Tg at which an amorphous polymer changes from a hard and relatively brittle condition to a viscous or rubbery condition. When this transition occurs, physical properties undergo significant changes. Some of those properties are hardness, brittleness, coefficient of thermal expansion, and specific heat. The total passive opposition offered to the flow of electrical current this term is generally used to describe high frequency circuit boards.